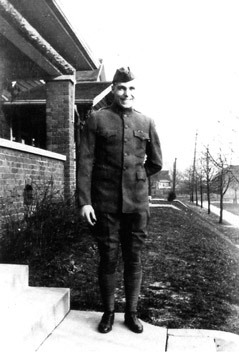 Private Lawrence Arbuckle, F Co., 7th Engineer Regt., 5th Division AEF poses outside his home in Greenwood, Indiana on his return from Europe, August 1919. Note Victory in Europe Medal ribbon on his left uniform pocket. This young soldier is typical of the 2 million men and women who served in the armed forces during the Great War.